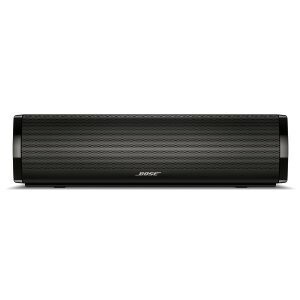 The simplest soundbar system from Bose. Dramatically improving your TV sound doesn’t have to be complicated. The CineMate 15 system delivers the sharp, full audio you’ve been missing, with deep bass you may have never heard from TV before–all from a compact soundbar and hideaway Acoustic mass module. How does a soundbar no longer than a ruler create such a wide soundstage? 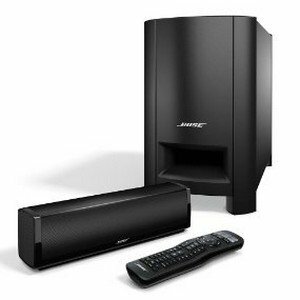 The four-element speaker array inside works with Bose TrueSpace signal processing to spread sound well beyond the speaker itself. The effect is more like being in a theater, immersed in the action. And if you’re playing a video game, the virtual world becomes even more real. While the system fills the room with sound, it takes up very little space. 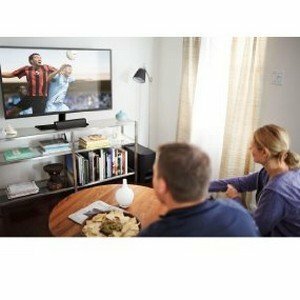 The soundbar fits right in front of your TV and connects with just one cable. Your other components can stay put and connected as is. And the Acoustic mass module can be conveniently placed out of sight. Practically no impact on your room. But the way you experience TV will be forever changed. While you’re enjoying the newfound clarity and spaciousness the CineMate 15 system brings you, you’ll also notice something entirely new–sounds you can feel. From the pulsating rhythm of a bass guitar to the dramatic effects of an action movie, you’ll finally discover the low notes your HDTV couldn’t come close to reproducing. All from a hideaway Acoustic mass module you can place almost anywhere in the front of your room, even behind furniture. The universal remote is likely the only remote you’ll need for all your sources-Blu-ray Disc player, cable box and more. It’s easy to program and easy to use, and it reduces remote clutter. Included: Soundbar (with attached speaker cable), Acoustic mass module, Power cord, Digital optical cable, Analog cable and Universal IR remote with 2 AA batteries. Feel the action with spacious sound and hard-hitting bass. Dramatically improving your TV sound doesn’t have to be complicated. The CineMate 15 system delivers the sharp, full audio you’ve been missing, with deep bass you may have never heard from TV before–all from a compact soundbar and hideaway Acoustimass module. How does a soundbar no longer than a ruler create such a wide soundstage? The four-element speaker array inside works with Bose TrueSpace signal processing to spread sound well beyond the speaker itself. The effect is more like being in a theater, immersed in the action. And if you’re playing a video game, the virtual world becomes even more real. The universal remote is likely the only remote you’ll need for all your sources—Blu-ray Disc player, cable box and more. It’s easy to program and easy to use, and it reduces remote clutter. 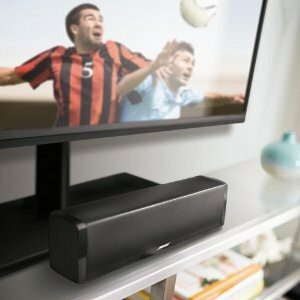 Compact soundbar extends sound way beyond the screen. While you’re enjoying the newfound clarity and spaciousness the CineMate 15 system brings you, you’ll also notice something entirely new–sounds you can feel. From the pulsating rhythm of a bass guitar to the dramatic effects of an action movie, you’ll finally discover the low notes your HDTV couldn’t come close to reproducing. All from a hideaway Acoustimass module you can place almost anywhere in the front of your room, even behind furniture.